Genuine multi-speaker surround sound can't be beaten if you crave real multichannel audio, but running cable to rears is sometimes a non-starter. So, can a 2.4GHz wireless link provide the answer? 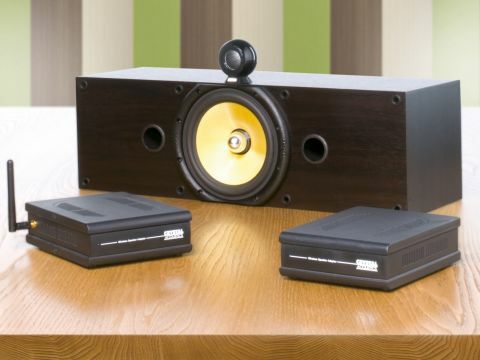 High-end speaker brand Crystal Audio thinks it can and has devised a novel wireless solution. The TR-100/120W combo auditioned here comprises two boxes - a transmitter (Tx) and a receiver (Rx). The Tx is connected to your amplifier at the speaker terminal. The Rx hooks into the speaker; this requires a small length of speaker wire to do so (not exactly wireless) as well as a power lead. Crystal Audio intends its technology to be used in conjunction with the rear effects speakers, saving you metres of speaker wire from your amp. The range is up to 100m outdoors (free space) but only up to 15m inside - more powerful/longer-range sets are available. Simply put, this system does what it says on the box. Sound was all but indistinguishable from when it was played just through the wires. Dynamics were good. The highest of tinkly sounds came through with only the slightest trace of audible dulling of the very sharpest parts of the edges. My 'walkabout' test was a success, too. Standing in the road on the end of the power cable, clutching my unit and the player, I could clearly hear the test rig chugging away upstairs. I even ducked behind the car and waved the transmitter around - no interruption. Crystal Audio's tech is good value in terms of radio signal transmission, reception and amplification, and could be the perfect solution for a viewing room where it is challenging to run cables.